Girls in topknots and bright tights filter past. Eyes closed, a shirtless man rests with his feet against a frescoed wall of the United Nations. A wash of prismatic color splashes against a stone pillar caught in the sunlight streaming through the stained glass high above. Through the multitude of voices sailing across pews and bouncing off the stone walls swells the beautiful, rippling notes of a harp. Riding the swell, the instructor—unseen from my position—hushes the chatter and brings everyone to a seated position. We begin with eight Oms. Not quite at home in my yogi skin (which I only don every now and again) I sit out the Oms. I’m surprised to find though that the chant, rich and full, begins to penetrate my muscles and prickle my nerves. Focus on the breathing. Exhale out downward dog, inhale down into cobra. Repeat. Beautiful stained glass. Of what? I squint, until a rustling around me shows a row of bodies lying prostrate in child’s pose. Down I go, too fast, nose to mat. Ah yes, remember to breathe. Engage. Be present. Stretch. Hold. Breathe. Breathe. Warrior two and the harp trickles warm down my spine. Straighten leg, twist, and stretch hand up into triangle. Breathe! Tips of fingers stre-e-e-e-t-ch upward. Hold! Hold! Tips of ears vibrating in unison with the harp. Whether in a mirror-walled, overly-air-conditioned classroom in a gym, or a billowy yoga studio presided over by portraits of Vishnu, meditation and intention rarely find me. Hyper-aware of my body’s limits, I’m thrust so inside my physical being that my muscles and bones become captors more than vehicles. Here, although still very much in and of my body, my organs, my bones, soften and fuzz. My eyeballs are in the tips of my stretching fingers. My lungs are round and plush, expanding beyond my ribcage and melding warmly with my stomach. Perhaps it’s the space, imbued with a real yet intangible presence of the spiritual. Perhaps it’s the absence of blocks, blankets, and straps—tools that only serve to further ground me solidly in my bumbling body. Or even the notes from the harp, live and vibrant, and the disembodied voice of the instructor as he slowly circumambulates the cathedral. Savasana. Lie down, loosen limbs, let eyelids slide close. Quiet. Stillness. Then the harp, sweet and gentle, begins to flow. Cascading over and around, it fills my brain and rolls to the tip of each nerve ending. When it’s time to reawaken my body, I wriggle my toes and fingers, slowly re-introducing the weight and strength that had seeped wondrously from my being. At the very last, I open my eyes to the soft flutter of ribbons above, and take in a deep, conscious-bringing breath. Namaste. Yoga on the Labyrinth is held at Grace Cathedral every Tuesday at 6:15 p.m. (though check the calendar each week). All levels of experience are welcome. 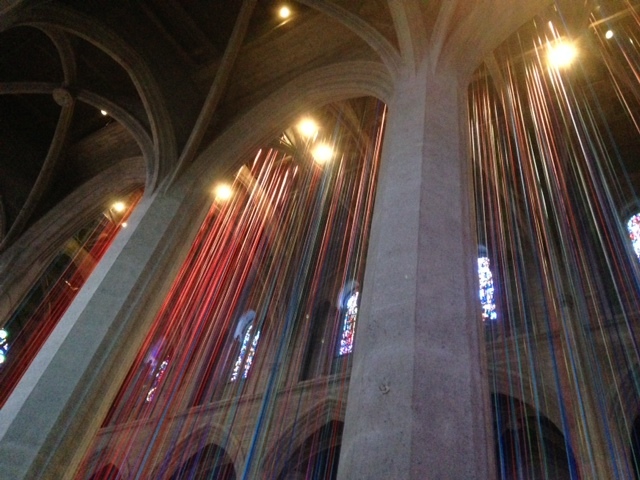 *The ribbons are a site-specific installation, Graced by Light, by Grace Cathedral’s 2013 Artist-in-Residence, Anne Patterson.